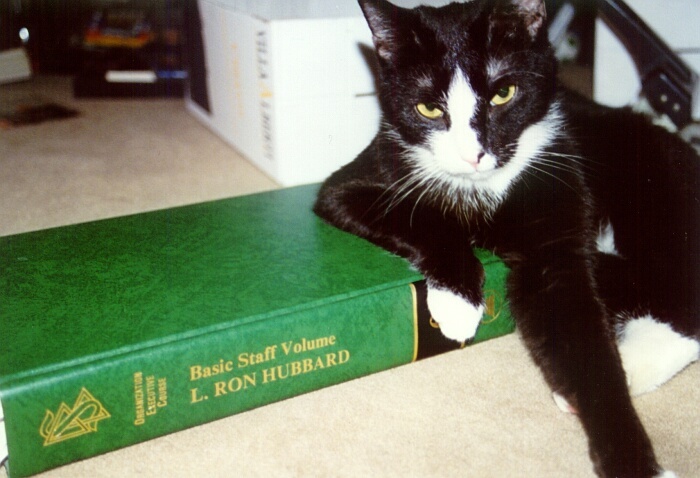 Scientology's "sacred scripture" includes all the writings and taped lectures of its founder, L. Ron Hubbard. A particularly important part of this scripture are the technical bulletins of Dianetics and Scientology, known as HCOBs, for "Hubbard Communications Office Bulletins". These are printed in red ink on white paper and published in a series of bound books with red covers known as the "red volumes", or "tech volumes". The bulletins set forth the details of Scientology's religious practices, including most importantly its brand of amateur psychotherapy known as "auditing", but also such practices as word clearing, clay table demonstrations, and use of the E-Meter. The red volumes are organized into two groups. Volumes I through XIII contain HCOBs ordered by date of original publication. Volumes 1-4, called "subject volumes", contain a subset of these HCOBs that were issued as part of a particular named series; they appear grouped together by series. The vocabulary and practices that make up Study Technology are defined in the Word Clearing series, which can be found in Subject Volume 2. Both the red and green volumes may be examined at Scientology churches and are available for sale to the public. But Scientology's "Advanced Spiritual Technology", known as the Operating Thetan or OT levels, is considered confidential and is never discussed in public. Leaked documents distributed over the Internet, and personal reports from ex-members, have revealed that this "technology" prescribes techniques for telepathic communication with the spirits of murdered space aliens known as "body thetans", who are believed to infest all humans here on Earth.